I've been taking dance lessons from an Arthur Murray franchise for several years now. I really enjoy it, but it's pricey. The lessons are pricey and the events are pricey, but the gowns are insanely expensive and I just can't bring myself to buy one of those gowns. But, I figured I could make one. I started by reading what I could find on the internet. Since I start trying to do this several years ago, there wasn't really much I could find. But I did find this great tutorial by Laura La Gassa and I read it and geared myself up to try it on my own. And I read every post on BGBallroom for inspiration. I knew how to sew and I owned a decent Singer sewing machine that got use for maybe one Halloween costume a year, if even that. But I really had never gotten into sewing actual clothes, so there was a lot that I didn't know yet. My first dress I did wasn't intended to be a dance dress, per se, but I was going to dance in it. I was supposed to do a short Viennese Waltz routine at a Masquerade themed spotlight ball. So, I decided I wanted something that fit the part. 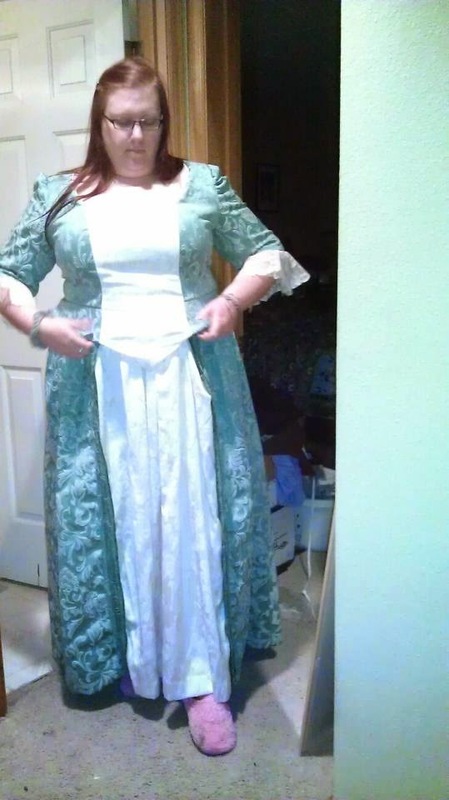 I went to a thrift store and bought a lovely mint green flocked bedspread, some off-white brocade curtains and a couple of lace doilies and I made the bodice from McCall's 6097 and just a floor length gathered skirt with an off-white panel in the front. I wore a large red wig and a mask for the dance I did. It's funny for me to watch this video because it was well before I started working on my lovely arms, so I cringe at all my "dead arms."